Call me a little partial, but I LOVE this app. Dysphagia2Go has given me a new way to utilize my iPad in my dysphagia therapy. I also can use it with the confidence that it is HIPAA compliant. Yes, I am one of the authors, but this app was created out of the need to complete a quick and simple Clinical Dysphagia Evaluation. This app was created to assist clinicians in assessing all areas for dysphagia and to complete a chart review that is as thorough as possible. When you open the app, you will first begin by adding your patient information. You can save patients or you can bring up previous patient information. When adding a new patient, you will be prompted to input a Patient ID, Patient first name, Patient last name, Patient Date of Birth and Physician’s Name. If you are not comfortable adding a patient name, you can assign each patient a number or simply use initials. One thing you will want to make sure to do is go under settings and add your therapist and institution information. Turn the information on to add it to your reports. Once you have added that patient, you can either view a saved report, or you can add a new evaluation. To begin the evaluation, you will select the chart review tab. The chart review will prompt you to input the reason for referral, physician order (yes or no), diagnosis, current method of nutrition, respiratory status, etc. There is also a text box that you can input any other pertinent information from your chart review. Don’t worry, new sections are being added to complete a more thorough chart review. 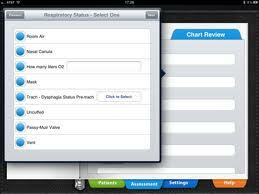 Once the chart review is completed, you can go assess the patient and begin to start the Oral Mech Exam. This will prompt you to input information regarding all the oral and pharyngeal areas that we assess, including the tongue, teeth, lips, etc. Upon completion of the Oral Mech Exam, you will be able to assess trials. Either use the consistencies provided or skip the consistencies not used. For each consistency, you will be able to assess oral control of the bolus, pharyngeal stage of the swallow and add any comments needed. The final section is the Recommendations section. You will be able to recommend compensatory strategies, exercises, MBSS, FEES, therapy, no therapy, or referrals. Once the evaluation is complete, you can download the report and either print it wirelessly or email it to yourself and print it. You also have the option to email it to yourself and cut and paste into your computer-generated report if your facility has a report that is required to be completed. A few tips to remember with this app, first and foremost, please make sure to lock your iPad with a passcode. This helps to ensure the privacy of the information that has been saved on your app and also helps to protect your valuable information that is stored on your iPad, should someone “borrow” it. Also, please remember that this is a work in progress. This app will continue to have new feature added. One feature that will soon be added is the cranial nerve assessment section. Please write a review of the app. This is how we as the authors and Smarty Ears will know how to improve the app so that it can be useful for everyone. We hope you enjoy Dysphagia2Go!! Dysphagia2Go is a revolutionary app connecting the dysphagia assessment world to technology. Dysphagia2Go offers an easy to use, HIPPA compliant** resource to complement your Clinical Dysphagia Evaluation. Dysphagia2Go guides you through the evaluation process with reminders to assess medications, cranial nerves and all the areas on which any good dysphagia evaluation should focus. This app provides a thorough evaluation report template developed by speech pathologists who have drawn upon their experience in varied settings to provide extensive opportunities to record chart reviews, assessment data, and recommendations in a single document, which can then be printed or e-mailed directly from the user’s iPad. Dysphagia2Go allows for easy, single touch evaluation results with an easy-to-print report. If you don’t find what you need on the app or have other comments that should be added, Dysphagia2Go offers comment boxes throughout to add your own evaluation information. Drop the pen and paper during your dysphagia app and use Dysphagia2Go for a quick and easy, complete Clinical Dysphagia Evaluation. While Dysphagia2Go provides an excellent resource for reporting data for swallowing assessments performed by a speech and language pathologist, it is NOT intended to replace an SLP’s clinical expertise or consultation. This app is not a replacement for clinical training and should not be used by individuals who are not experienced licensed speech and language pathologists.